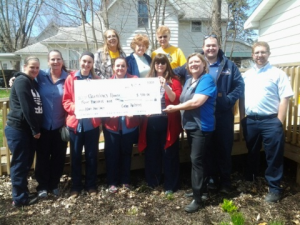 CINTAS partners present Quinton’s House with a $400 check as part of their fundraising effort for the group which aids those under 18 who have to deal with physical and sexual abuse. The partners of CINTAS presented a check of $400 to Quinton’s House Friday afternoon as part of their fundraising effort to aid those under 18 who are victims of physical and sexual abuse in Clinton County. Thank you Ken and the rest of the staff at WILO/Shine99 &Clintoncountydailynews.com for supporting Quinton’s House in the way that you have! Awareness about keeping our children in Clinton County safe is what it’s all about and you have been there for that! You are the BEST!